One survey of subway elevator breakdowns found that, on average, each elevator breaks down 53 times a year. A lawsuit filed against the Metropolitan Transportation Authority, which operates the subway, described New York’s subway system as one of the least accessible in the country and accused the agency of violating the federal Americans With Disabilities Act. The subway’s leader, Andy Byford, has promised to add enough elevators to the subway system by 2025 so that no rider would be more than two stops from an accessible station. Mr. Elegudin uses a wheelchair after he had a spinal cord injury stemming from a deer-related car accident in 2003. New Yorkers with young children said the scenario was all too familiar. On a popular Facebook group for mothers, one woman posted about her death, saying she hoped it would serve as a “wake up call” for a system that keeps raising fares, but fails to help disabled riders and families. The MTA's blatant disregard for ADA accessibility rules has now resulted in someone's death. Despicable. This is despicable. Funding for project such as ESI on the subway and the commuter RRs, projects such as the East Yaphank stop, the LIRR Third Track could have been used for ADA. They better remove the remainder of ESI stations in 2020-2024 for accessibility. I hope that the MTA loses the lawsuit big time. I get why the MTA should be attacked but the woman was alone while traveling down the stairs. Not saying the lawsuit should not happen but if you don't have the strength to do manual labor like this you should get some help even if you got to ask strangers. That's what many mothers do if they are carrying a stroller do anyways. And since this was in Manhattan [I believe] there should of been someone around to help. Who says she didn't have the strength? She might have slipped on the wet ground. I've slipped and hurt myself on subway stairs, and I'm an able bodied male who works out regularly. Who said she did? We don't really know much about the mother or the incident. (And saying that now I probably should of said something a bit different.) Anyways, anything could of happened realistically. Her knee could of gave out, someone might of accidentally pushed her, and like you said, she might of slipped or misstepped. And this isn't even counting disabilities or medical conditions that may make going down the stairs a bit harder. Yes the MTA should be more accessible, but this situation dosen't have enough info to make me (I'm going to get hate for this) feel like I should be feeling 100% sorry for the mother like that. Well you know, there's bad people on both sides. Can't blame one more than the other. Bad people on both sides??? There is no good reason why anyone should have to require and/or wait for a stranger to help them up/down stairs in the subway in 2019. Point blank. 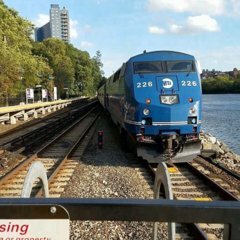 Why so many MTA apologists? Yeah, she could have become a gymnast and made it down safely. The folks in wheelchairs also could have not been in wars or hit by cars or afflicted with diseases in the first place, either. The point is that there the MTA's inaction on elevators was what put her at risk. That's unacceptable. I really never realized how difficult NYC is to navigate if you are not able-bodied until I read a book called "My Body Politic," about a professor who becomes wheelchair-bound in NYC and suddenly learns how challenging it is. I highly recommend the book, very eye-opening. For example, I did not realize that up until a few years ago, a lot of streets did not even have curb cuts, which meant it was impossible for anyone in a scooter or wheelchair to even cross the street. I have some disabled people in my advocacy group that use the express bus and they have horror stories. I have taken a tour of some of the bus stops that they have to use as wheelchair riders. It's appalling, even for an able bodied person. The sidewalks are seriously warped. Cracks and mud all over. Even I had trouble walking. I have no idea how people in wheelchairs manage at some stops. The sidewalks also vary. All different sorts, and warped as you go up hill and down hill. Shore Road in Bay Ridge... My God... With all of the $$$ in that area, it was amazing how horrendous the sidewalks are from 99th all the way up to Bay Ridge Parkway. Most sidewalks are a mess. ADA accessible or not, the woman took a RISK. New York State funding isn’t perfect or up to par to assume every station should have elevators. The station has been there 100 years, no fatalities because someone HAD to walk up or Down the stairs... some of y’all have to stop being so hypersensitive and quickly making the Agency to be the worst thing to happen to New York City. ADA accessible or not, the woman took a RISK. New York State funding isn’t perfect or up to par to assume every station should have elevators. The station has been there 100 years, no fatalities because someone HAD to walk up or Down the stairs... some of y’all have to stop being so hypersensitive and quickly making the Agency to be the w﻿orst thing to happen to New York City. What risk?? She is entitled to walk with her child and use the subway in 2019. In this case they are saying she likely had a health episode. Nevertheless, you have no idea what it's like for disabled people in this City that are SHUT OUT from the subway system simply because they aren't able bodied. They pay taxes just like able bodied people do and it's a disgrace that they've had to file lawsuits and constantly hound the to attempt to live a normal life. They have a high unemployment rate simply because they don't have access to reliable transportation in the same way that we DO, so most are doomed to a life of poverty. Just think about that for a second. To put things into perspective, there is ONE subway station where I live at with elevators... ONE. If that elevator goes out the next one is all the way in Washington Heights. If you were stricken with a leg injury or something like I was and had to hobble around, your perspective would change quite quickly. I was hobbled for a few weeks and it was HELL. Very few elevators and I was literally in pain getting to and from. Hell, even with me being able to walk, I still don't feel like taking all of those stairs. It's a pain in the @ss after working a long day. It's nice to take the elevator sometimes. I'm just trying to understand since when are people not expected to feel safe walking down stairs or waiting for a train. The 's job is to provide a SAFE environment to the extent possible. Not only that but most people won't help anyway. I've done it on occasion but people tend to be too absorbed in their own world to help out with things like that. What risk?? She is entitled to walk with her child and use the subway in 2019. In this case they are saying she likely had a health episode. Nevertheless, you have no idea what it's like for disabled people in this City that are SHUT OUT from the subway system simply because they aren't able bodied. They pay taxes just like able bodied people do and it's a disgrace that they've had to file lawsuits and constantly hound the to attempt to live a normal life. They have a high unemployment rate simply because they don't have access to reliable transportation in the same way that we can, so most are doomed to a life of poverty. Just think about that for a second. If you were stricken with a leg injury or something like I was and had to hobble around, your respective would change quite quickly. I was hobbled for a few weeks and it was HELL. Very few elevators and I was literally in pain getting to and from. Hell, even with me being able to walk, I still don't feel like taking all of those stairs. It's a pain in the @ss after working a long day. It's nice to take the elevator sometimes. Right now I am dealing with a condition that dosen't limited my mobility like other disabled people but at times it can be very hard to walk up/down the stairs. So I can somewhat relate. The main point I want to make is that we do need a lot more accessibility but [I feel] it's not serious enough to fully blame the MTA. Most of the subway was built in the 1930's, where people saw things differently. And due to this pov and the fast growth of the city there are a lot of areas that makes elevator installment difficult especially below midtown Manhattan. Just a quick rundown on how many things cause inequality in the past. Women were slowly being accepted to do more by the time IND opened, racism was starting to slow down in the 1970's, and by 1990 disabled came into the picture. And even where I live at there are many buildings where residents can not use a ramp to make things easier. In fact we just finished one building with many more due for completion this year. Just like everyone else here I want a lot more elevators in a lot more stations. If the lawsuit makes ada accessibility faster that would be great, but I'm not out to get a grudge on the MTA especially when Byford is pushing for ada accessibility as well. This also contributes accidents. People don't know how to be clean and leave litter around which may cause others to slip. Not to mention other "fluids" that may be on poles and floors which causes you to adjust your mobility. The chance of this happening would have been much lower with elevator access, period. So what? That's an excuse. The has been trying to get by without installing elevators in stations that they are rehabbing where they can actually install them. That's a problem. They'd rather spend more money on cosmetic nonsense than make the stations functional and accessible. Artwork is nice and important in its own way, but it doesn't move people. If we aren't to blame to the for not making more stations accessible, then who? For what it's worth, without these lawsuits brought on by various disability groups, we wouldn't even have the elevators that exist, which are few and far in between. I can tell you right now that bringing on a lawsuit is not something that these groups want to do. Ideally they'd like to work out some sort of agreement with the , but the only way to work with the is to play hardball, and I know this based on what I've been dealing with with them. As people I speak with on the inside say, they are fixated on numbers and figures. I'd like to remind the audience that 7th Avenue-53rd Street was renovated in the 1990's in a time when ADA was already the law. Under the law it should have received an elevator. By not doing so, the MTA is directly breaking the law and it has directly broken the law on numerous occasions since; meanwhile in other cities like Boston, Philadelphia and Chicago, they have installed elevators and/or ramps in all of their station renovations to date. It especially rich for Cuomo to state accessibility is a priority when none of the ESI stations have elevators. You are correct on this matter. these rehabs are just half@$$ed and it's basically "oh look USBs and wi-fi" and call it a day. This is unacceptable. If we call the MTA out on this constantly, then sooner or later these rehabilitations will have to come with elevators. Most stations are easy to put elevators in, but a lot of the work has to do with building pedestrian plazas and widening platforms. I'm still wondering how to make 14 st accessible with those narrow platforms and passageways as well as Canal Street . There were probably a couple more areas that were hard to do but the necessary accommodations were likely already made or not needed. As for who to blame, the ADA avoidment dosen't just apply to the MTA. In general the lack of ADA in the city goes to NYCHA, Cuomo, and possibly a few more agencies in NYC. I never said there is no reason to do a lawsuit. I'm saying its a lot of work to do with these accessibility plans. And honestly I think 7 Av is an easy spot to put elevators. It's just the fact that the MTA is terrible with their budget and dosen't focus on the right things.